This article was originally posted in December 2012. It is of utmost relevance in assessing the present situation. It documents the fact that the Al Qaeda affiliated rebels (including the ISIS) operating in Syria are directly supported by Washington. The Lies of London’s Sunday Times regarding Obama’s counter-terrorism campaign against the ISIS is refuted by an earlier Sunday Times report. The Sunday Times report quoted below confirms that Obama has been arming the terrorists for the last three years, since 2012. 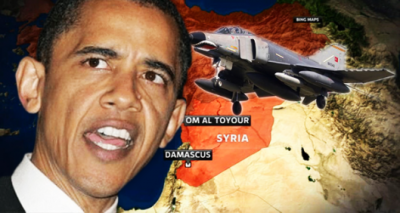 The Obama administration has decided to launch a covert operation to send heavy weapons to Syrian rebels [December 2012], Christina Lamb of The Sunday Times of London reports. The heavy arms include mortars, rocket propelled grenades, anti-tank missiles and the controversial anti-aircraft heat-seeking SA-7 missiles, which are integral to countering Bashar Al-Assad’s bombing campaign. Many have suspected that the US was already involved in sending heavy arms. Last month The Wall Street Journal reported that the State Department presence in Benghazi “provided diplomatic cover” for the now-exposed CIA annex. It follows that the “weapons transfer” that Stevens negotiated may have involved sending heavy weapons recovered by the CIA to the revolutionaries in Syria. The newest report comes days before the U.S. is expected to recognize the newest Syrian coalition as the legitimate representative of the Syrian people. The State Department has also indicated it will soon name the opposition’s highly effective al-Nusra Front a “terrorist organization” for its ties to Al Qaeda in Iraq (AQI). Both of these stipulations — recognition of a unified opposition and creation of distance from extremists — are pivotal in order for the Obama administration to openly acknowledge supporting Syrian rebels with heavy weapons.